Jacobsen was trained as an engineer who initially worked in the textile industry in England and Switzerland. 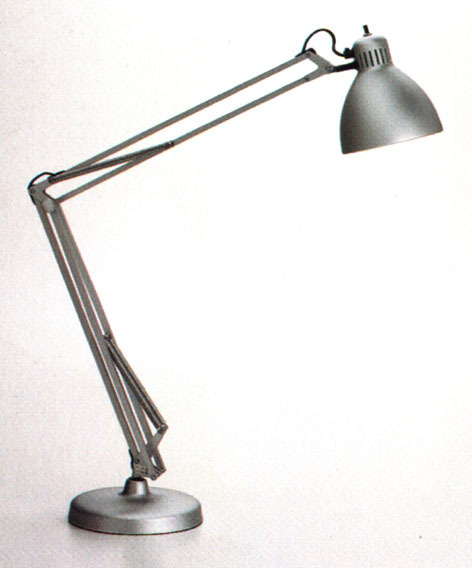 In 1937 he bought the production rights to the George Carwadine, Anglepoise task lamp produced in 1934. In the same year Jacobsen designed a variation of the Anglepoise, which he named the Luxor L-1. The Luxor below incorporates a similar auto-balancing system of springs based upon the constant tension principle of human limbs. Jacobsen slightly refined the original design. It had a more refined connection between the shade and the stand and looked a little more aesthetically pleasing. In the next few years Jacobsen managed to acquire the United States production rights to the Anglepoise's constant tension principle and during the 1940's sold the lights in large quantities throughout both Europe and America. Jacobsen's company Luxor still sells the classic Luxor L-1. The Luxor has won numerous design awards and is in the permanent collection at the Museum of Modern Art, New York. The Luxor has been imitated over the years but these imitations do not better the technical performance of the original. It is noted for the ease at which the shade and arm are articulated.